Hydrops fetalis appears in many different ways as a nonspesific finding, characterized by accumulation of fluid in the fetal tissues and body cavities. Nonimmün hydrops fetalis, constitutes 85% of all cases of hydrops. Hydrops play a 3 important role in the pathogenesis of fetalisin. 2. Factors that may increase intravascular hydrostatic pressure. 3. Factors in reducing intravascular osmotic pressure. Disruption of lymphatic flow results in fluid accumulation in the fetal edema. It can cause some congenital heart anomalies and rhythm disturbances, prolonged circulation time,venous distension, hepatomegaly, a hemodynamic disorder characterized by edema and tissue as a result of inadequate perfusion. Venous pressure may lead to prevention oflymphatic by passing the lymphatic pressure. Hipoproteinem fetal may occur secondary to degration of liver albumin synthesis and loss of plasm proteins. If hypoproteinemia developes, the relative decrease in protein will be more than plasma in interstitium. By the initial distribution of proteins, traskapiller osmotic colloid osmotic pressure is maintained. When decrease in interstitial colloid osmoticpressure can’t compansate the decrease in plasma osmotic pressure, a net increase in the volume of liquid infiltration and interstitial fluid, edema occurs. Hipoproteinem fetal liver may occur secondary to failure of albumin synthesis in liver and loss of plasma protein. If hypoproteinemia develops, relative decrease in proteins are higher than the interstitum to plasma the interstitium to plasma protein is higher than the relative decline. Initial distribution of proteins maintains the traskapiller osmotic colloid osmotic pressure. If the decrease in interstitial colloid osmotic pressure can’t compensate the decrease in plasma osmotic pressure, a net increase in the volume of liquid infiltration and interstitialfluid, edema occurs. Protein synthesis in hepatocytes reduces as a result of disruption of protein synthesis by hepatocytes or liver erythropoietic hypoxia depending on the transformation of a tissue. Heart failure may lead to congestive hepatomegaly and malfunction. 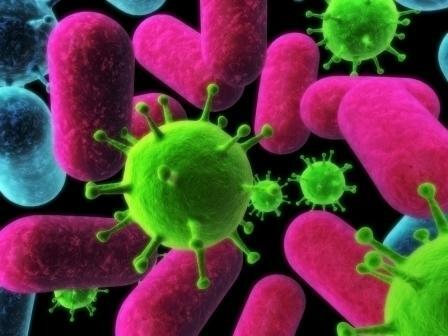 Inherited metabolic diseases and intrauterine infections can also cause liver damage and the other caseshypoproteinaemia. In the etiology of hydrops nonimmün fetalisin, lots of fetal and maternal pathologies have roles. Chromosome abnormalities, fetal abnormalities, metabolic disorders, intrauterineinfections, Feto-maternal or twin-twin transfusion, thalassemia, arterio-venous shunt, gastrointestinal, cardiac, pulmonary pathology are among the etiological factors. They can appear in hydrops fetalis table with Down’s syndrome and other trisomic Turner syndrome, such as the different chromosomal abnormalities triploidies. Hydrops is a frequent finding in metabolic diseases. In cases with hydrops, the prognosis is poor. In twin pregnancies, twin-twin transfusion which is the result of fetal structural abnormalities or placental vascular abnormalities may cause hydrops fetalis. 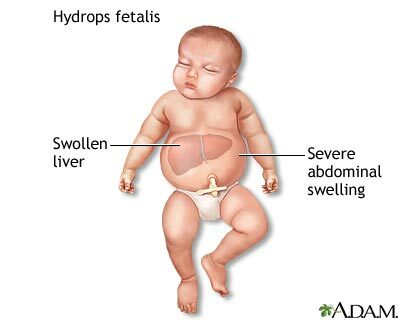 Hydrops fetalis often arise from the recipient fetus can also be seen in the donor fetus. Adenoid cystic tumors of the lung may cause failures in venous system by increasing intrathoracic pressure. Thus, initially causing pleural effusion and then to hydrops. Toxoplasmosis, CMV, parvovirus, syphilis, leptospirosis, Chagas disease, and congenital hepatitis diseases are seen with nonimmün hydrops. Diagnosis of hydrops fetalis is made by routine ultrasonography during follow-up antenatal. Ultrasonographic identification of fetal hydrops, regardless of etiology, skin thickness ismore than 5. The basic rule in the treatment of fetal hydrops is early diagnosis and correct all of the underlying etiologic factors. The first steps in research in a hydropic fetus when it is first detected are maternal complete blood count, Kleihauer-Betke test, blood group and Rh, indirect Coombs test (rh-negative cases), TORCH titers, parvovirus B 19, and serological studies for syphilis, G6PDH deficiency and hemoglobinopathy screenings. When chromosome abnormalities are detected in some cases of Nonimmün hydrops; amniocentesis, placental biopsy or cordocentesis for karyotype determination method should be made. It can be determined hemoglobinopathy, such as thrombocytopenia or combined etiologic with fetal blood sampling. Therapeutic abortion is done in cases of chromosome abnormalities. Approach to cardiovascular pathologies related cases from termination of pregnancy to the early post-natal care and delivery operations are variable. Intrauterine infection with parvovirus B19 is composed of fetal anemia. With Intrauterine fetal transfusion, fetal anemia, hydrops can be prevented. Severe diabetes, anemia and hypoproteinemia which are among maternal causes can be avoided by anternatal follow and treatment. Thus this process prevents the development ofhydrops fetalis.